Enhancing the quality of life through exercise. PSI is the only Romana's Pilates method Instructor certification school in the Northwest. We offer excellence in training and Continuing Professional Education. Stretch. Strength. Control. A unique approach to physical conditioning using custom apparatus and over 500 original exercises to lengthen and strengthen the human body. Our PT’s work with many conditions: professional athletes with a torn muscle, injured weekend warriors, office workers with neck and back pain, to the more senior patient with a sprained wrist or twisted ankle. An immersive, hands-on, 700-hr apprenticeship with PSI’s Instructor Trainer Lauren Stephen and seminars with guest master and grand master Romana’s Pilates instructor trainers. 1. Friday, April 19th | Steve at 3pm | Only $50 + Tax | Call (206) 405-3560 to book. New to Pilates or to our studio? Visit our Pilates page to find out how to get started! Build a strong powerhouse with Mat and Springs Classes! Offered several times a week to complement private and semi-private training. Find insurance information, downloadable new patient forms and more. 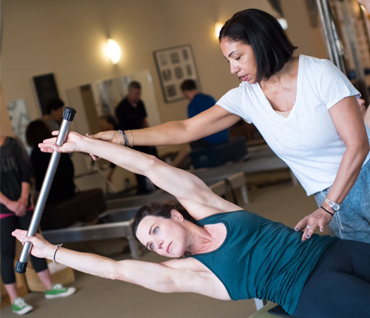 Learn about our PTs, what we treat, and how Pilates exercise augments physical therapy. 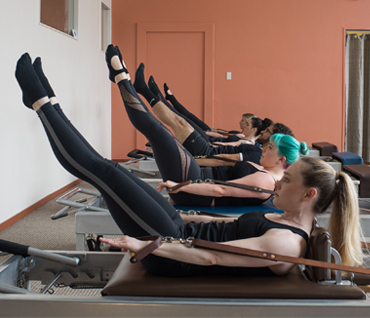 We offer educational opportunities regularly for clients, apprentices, and certified Pilates instructors. Don’t miss an opportunity to take a lesson or workshop with a visiting instructor! Perennial PSI favorite and Roman’s Pilates Teacher Trainer and Level II Instructor Cynthia Lochard returns to Seattle May 24 – 26 for CPE, a series of classes and private lessons. More details coming soon. Pioneers of using Pilates as a method of rehab.